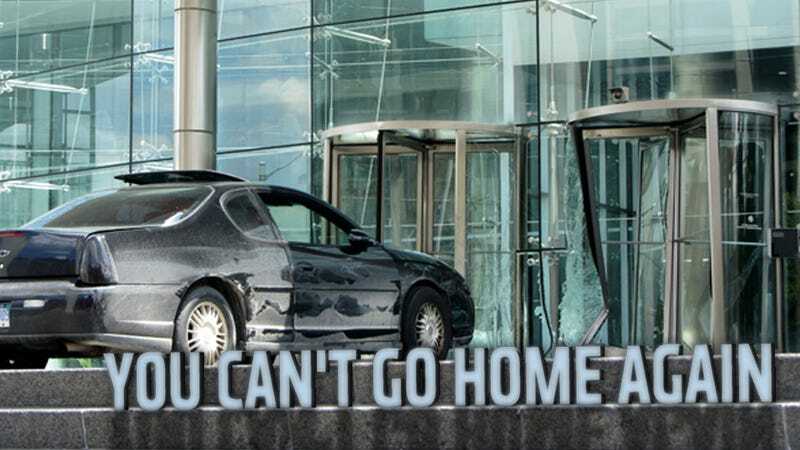 At about 2 PM yesterday afternoon, a man in a filthy 6th-gen Chevrolet Monte Carlo drove into the front revolving doors of GM's headquarters in Detroit, the Renaissance Center. The Ren Cen, as it's known to close friends, suffered damage to some glass panels on the front and one of the main revolving doors. The man's excuse is both crazy and perfectly sensible. At first one might simply think GM had issued a remote recall of some kind, causing her automotive children to return home and dock with the mothership, but the fact that this Chevy was the only one to make the attempt pretty much rules that out. That, and there is no car docking port in the pedestrian entrance, and because, you know, revolving door. "A witness said the man told the guard that if he was going to jail for hitting the building that he may as well drive right through it..."
This, of course, seems like great thinking to get the most out of those insurance premiums, cleverly turning a forgettable driving mishap into an actual event. A plan in mind, the man drove right into the revolving door, damaging its frame and shattering several of the large glass panels that make up the Ren Cen's exterior. Mission accomplished! The driver is now in police custody. GM has not issued a statement mentioning if it is disappointed in the Monte Carlo's disrespect to its mother.